Reference number for this case: Oct-54-Dompaire. Thank you for including this reference number in any correspondence with me regarding this case. 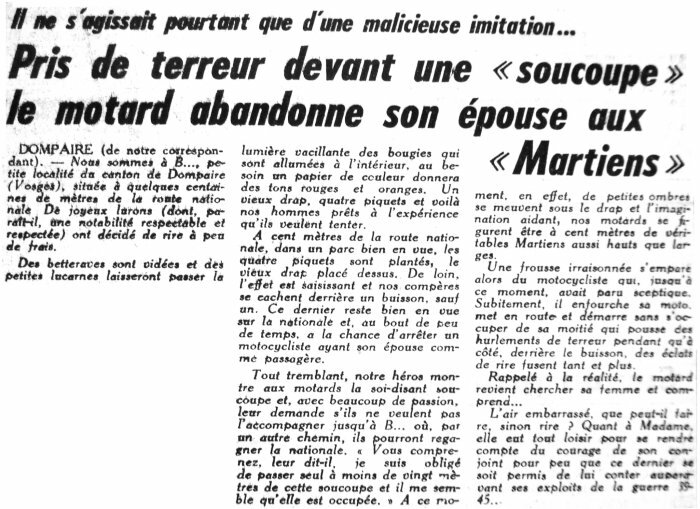 Terrified in front of a "saucer" the motorcyclist abandons his wife to the "Martians"
DOMPAIRE, (from our correspondent). -- We are in B..., small locality of the canton of Dompaire (the Vosges), located at a few hundreds meters of the national road. Jolly fellows (among those, it is said, is a respectable and respected notability) decided to have a laugh with few expenses. Beets are emptied and of small windows will let pass the wavering light of the candles which are lit inside, to the need a color paper will give red and orange tones. An old cloth, four stakes and here are our men ready with the experiment which they want to try. At a hundred meters of the national road, in a park well in sight, the four stakes are planted, the old cloth placed above. From a distance, the effect is seizing and our accomplices hide behind a bush, except one. The latter remains well in sight on the main road and, at the end of a short while, has the luck to to stop a motorcylcist having his wife as passenger. All trembling, our hero shows to the motorcyclists the so-called saucer and, with much passion, asks them if they would accompany him to B... where, by another way, they will be able to reach the main road again. "You see, he tells them, I am forced to pass at less than twenty meters of this saucer and it seems to me that it is occupied." At this time, indeed, small shades are moving under the cloth and imagination helping, our motorcyclists believe they are at a hundred meters of Martians as tall as they are broad. An unreasoned fear seizes then the motorcyclist who, until this moment, had appeared skeptical. Suddenly, he climbs on his motor bike, starts and flees without taking care of his spouse which yells of terror while next to them, behind the bush, laughter burst more and and more. We are in B., small locality of the canton of Dompaire located a few hundred meters Of the national highway. Happy pranksters (among them, it seems, a respectable and respected notable) decided to laugh at little cost. Beets are emptied and small holes will let out the flickering light of the candles that are lit inside, if necessary a colored paper will give a red orange hue. An old sheet, four pickets, and here are our men ready to try the expereinces they wanted to make. At a hundred meters from the national road, in a prominent park, the four stakes are planted, the Old cloth placed on it. From a distance the effect is striking and our comrades hide behind a bush, except one. The latter remains in sight on the national road and after a short time he has the chance to stop a motorcyclist with his wife as a passenger. All trembling our hero shows the biker the so-called saucer and, with lots of passion, asks them if they do not want to accompany him to B... where, by another way they can reach again the national road. "You understand," he told them, "I am obliged to go alone at less than twenty meters from this saucer and, it seems to me that it is occupied", at that moment indeed small shadows move under the sheet and imagination helping, our bikers figure to be one hundred meters from true Martians as tall as wide. An irrational shudder takes hold of the motorcyclist who until then had seemed skeptical. Suddenly he rides his bike, starts it without taking care of his spouse who screams in terror, while at the side, behind the bushes bursts of laughter starts so much more. Recalled to reality the biker returns to look for his wife and understands... Embarrassed, what can he do but laugh? In the few kilometers around Dompaire, and not far from what seemed to have been the national road at the time, are two villages whose name starts with "B": Boquegney and Bettegney. The story has some dubious sides, for example when the accomplices are hidden behind a bush "next to them" whereas they were supposed to be at a hundred meters. Thus it is either indeed a prank by the villagers, or it is a journalistic invention of the correspondent eager to offer his newspaper a picturesque and "edifying" story on the "Martians". [lr1] Article in the regional newspaper L'Est Républicain, France, October 21, 1954. [le1] Article in the regional newspaper L'Est Républicain, France, page 4, October 22, 1954. 0.1 Patrick Gross May 29, 2010 First published, [lr1]. 1.0 Patrick Gross December 2, 2016 Addition [le1].